Many presenters take advantage of the ease with which mountains of verbose slides can be produced in not time using PowerPoint. In truth, Death by PowerPoint became a cliche because presentations are usually designed by presenters, for presenters, making the creation of a lot of information way to easy. In this 30-minute Webinar, we look at mistakes to avoid, key mindsets and practices to breathe new life into your presentations, and potential barriers to enacting best practices. Most organizations are operating in a virtual hamster wheel intent on finding problems, processing information, proposing solutions, and executing actions plans. Rarely do we question the context from which these problems arise and within which they are defined. Shifting context is not that hard and it changes everything. So what if we could shift contexts to improve results? The strengths of dynamic, high energy speakers isn’t always best for a group. In this one-hour webinar, you’ll learn 3 skills that you can use without surrendering your strengths as a presenter to empower your audience. I model being a listener as much as a speaker during this call, so that you are engaged and participating as much as I am. This webinar offers listeners the experience of an Offline Partner Activity (OFA) for use in an online course. In this one-hour webinar, participants participate in a live OFA, and learn the pitfalls and procedures for effectively setting up and facilitating one themselves. As teachers and trainers, you’ve probably noticed that people really learn better through experience than by simply listening to talk about theory or practice. For almost any situation, you can develop an experience to either instruct or model the learning you’re trying to facilitate. During this one-hour webinar you’ll experience the Kolb Learning Cycle, the theory behind it, and the procedures for effectively setting up and facilitating this cycle yourself. The majority of managers spend at least 50% of their time in meetings every week. 69% of those meetings are unproductive! 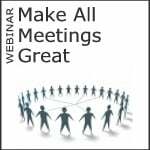 In this one-hour webinar, you’ll learn the Five phases and 25 steps that must be addressed for every meeting to be successful. You’ll shift your view of meetings and how they fit in to your work life and learn to increase meeting Return on Investment.